"AKA 'Diablo Dip,' this is creamy, spicy, gooey, crunchy, and so tasty! Great served with chips or spread on a bacon cheeseburger. I make mine with low-fat cream cheese and sour cream, and no one can tell because there is so much other taste going on. Wonderful!" Mix cream cheese, sour cream, canned jalapeno peppers with juice, green chiles, diced jalapeno pepper, cilantro, and ranch dressing mix together in a bowl until smooth. Add about half the Cheddar cheese and half the Parmesan cheese; stir. Spread the cheese mixture into a baking dish. 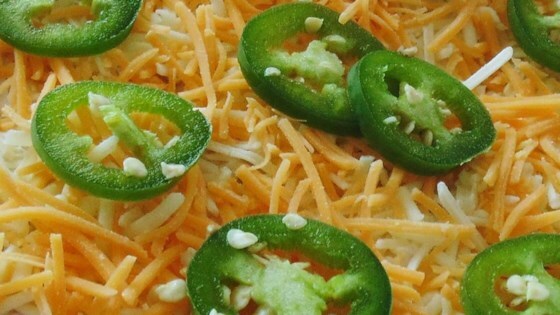 Arrange jalapeno slices atop the cheese mixture; top with remaining Cheddar and Parmesan cheeses. Cover baking dish with aluminum foil. Bake in preheated oven until top is warm and bubbling, about 25 minutes. Quick prep cheesy dip for parties, barbecues and cookouts! Easy. Yummy. Made as directed and everyone enjoyed it. This turned out fantastic! I served at one of our BBQs and it went really fast. Everybody really liked it. I will for sure be making this when we entertain. very good ... used 1 cup of ranch dressing, instead of envelope of ranch dressing and sour cream. Was amazing. No changes, just followed the recipe and it was fabulous! Everybody really enjoyed it . Always a hit with the kids and for parties! So easy to make. Everyone loved it. Just the right bite. Served with tortilla chips. Definitely will make again. I baked through until cheese on top was bubbly.